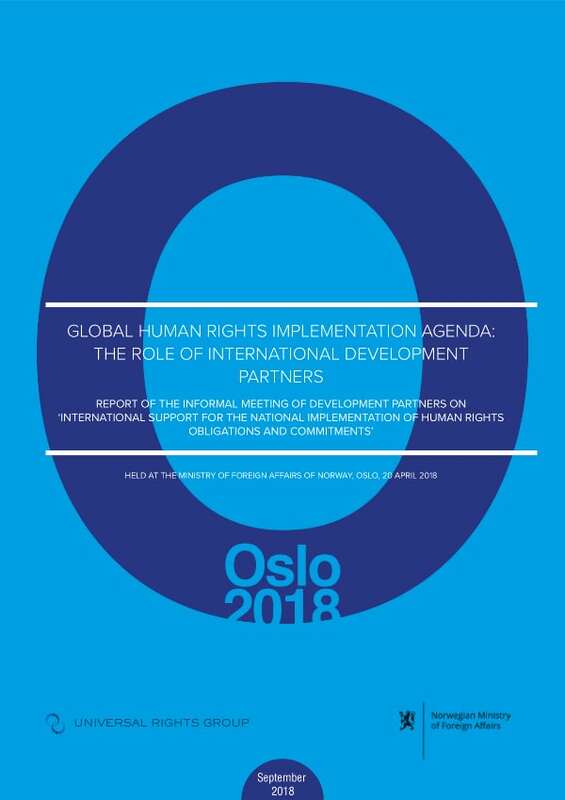 The report is based on discussions during, and the outcomes of, an important meeting of bilateral development agencies, relevant UN programmes and organisations, and multilateral development banks, held at the Ministry of Foreign Affairs of Norway, Oslo, in April 2018. That meeting, organised by the Ministry of Foreign Affairs with the support of the Universal Rights Group, covered a number of themes of importance to the construction of a global human rights implementation agenda, including: human rights and the SDGs; the establishment and development of ’national mechanisms for implementation, reporting and follow-up’ (NMIRFs), including through the mobilisation of information technology solutions; the monitoring, measurement and showcasing of on-the-ground impact; evolutions in the concept of ‘rights-based approaches’ to development; bilateral development support for human rights implementation; and multilateral development support for human rights implementation. In order to respect the ‘Chatham House rule’ under which the meeting was held, the report does not attribute comments made or conclusions reached to any of the individual participants or their respective organisations.